The temperature of the ACIS detectors is regulated using a passive radiator and active heaters. 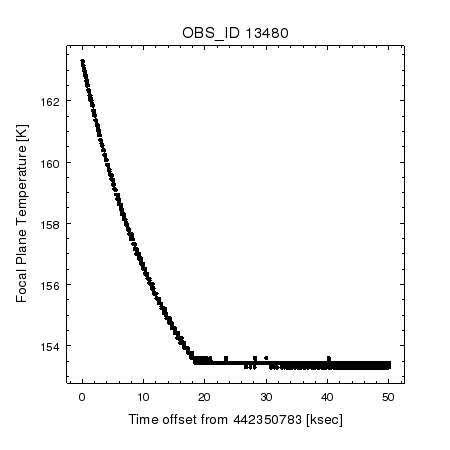 The focal plane temperature is measured periodically using a resistance thermometer and recorded, as a function of time, in an observation-specific mission timeline file (acisf*_mtl1.fits). The median focal plane temperature during an observation (in units of Kelvin) is recorded by the keyword FP_TEMP of the event-data file. This distribution of temperatures is typical for many observations. The FP_TEMP values are read out at arbitrary times but have highly quantized or discrete values. 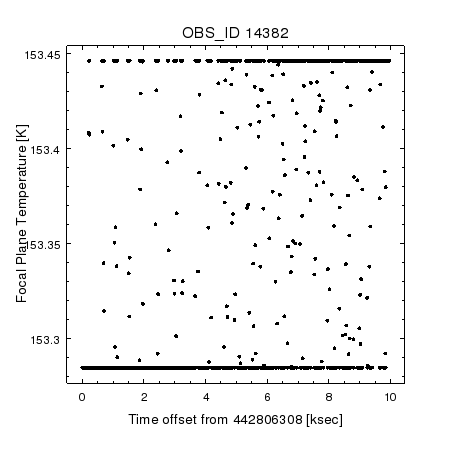 These values are linearly interpolated to the time grid used in the mission timeline which leads to the scattering of data points between the two discrete readout vaules at roughly 153.285 and 153.446 K.
This plot shows the temperature increase at perigee, and the long time it requires to cool to its set-point temperature. The lower temperature of -119.7 °C yields better spectral resolution for the front-illuminated (FI) ACIS detectors. However, due in part to an increasingly restrictive set of constraints on the orientation of the spacecraft, it has become more difficult to maintain a stable temperature at this setting. Deviations from the set-point temperature can occur during an observation, particularly for observations that occur shortly after perigee. While most deviations are less than 1 °C, they can be as large as 10 °C (e.g. Figure 2). Since the FI ACIS charge-transfer inefficiencies (CTIs) are temperature sensitive, deviations from the set-point temperature lead to changes in the effective gains and energy resolutions of the ACIS detectors. The effective gain is calibrated using data with temperatures near each set-point temperature. Furthermore, a temperature-dependent adjustment to the gain is calibrated for deviations from -119.7 °C, over the range from about -120 to -114 °C. This adjustment is built into the CTI adjustment applied by the tool acis_process_events. The ACIS response matrices are calibrated at temperatures of -119.7 and -109.2 °C, but not at temperatures in between. Therefore, analyses of ACIS spectral data can be affected by changes in the focal plane temperature during an observation. While deviations in the focal plane temperature can also influence the effective area of grating spectral analyses through the order sorting performed by the tool tg_resolve_events, analyses of imaging and timing data are insensitive to deviations in the focal plane temperature. Users who are concerned that their data may be adversely affected by changes in the focal plane temperature should contact the CXC Helpdesk.